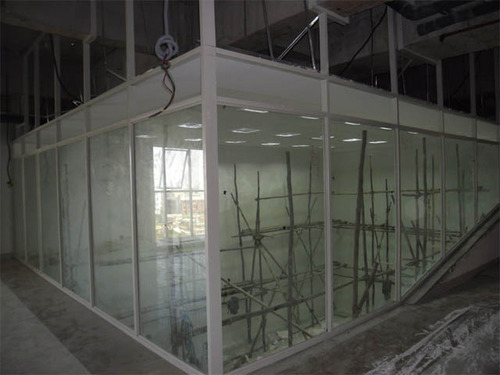 We render our new product of sound proof partition with laminated glass and with acoustic materials. We are looking for queries from Bangalore, Karnataka only. Empowered with a sound knowledge about our field coupled with the expertise of the highly talented and qualified team, we fabricate a wide range of Aluminium Structural Glazing. This range includes Structural Glazing, Aluminum Double Glazing Sound Proof System, Aluminum Windows, Aluminum Sliding Windows, Aluminum Doors, Aluminum Partitions, Aluminum Wall Cladding, Aluminum Sliding Windows, Structural Facade, Curtain Walls, False Ceiling, Sound Proof Glass Partition, ACP & Glass Cladding, ACP Wall Cladding and Aluminum Composite Panel Cladding. We offer interior decorating services, which are highly valuable to the clients, who desire for contemporary and unique look for their homes or establishments. Serving our clients for near about 22 years, we have transformed ourselves as a mature organization taking care of each minute specification of the customers and have become their leading choice.